Other small items: swimming kits, garbage bags, fishing tackles and more. Please note due to the lighting and computer screen display, there might be minor difference in color with the actual product you receive. Thank you for your kind understanding. 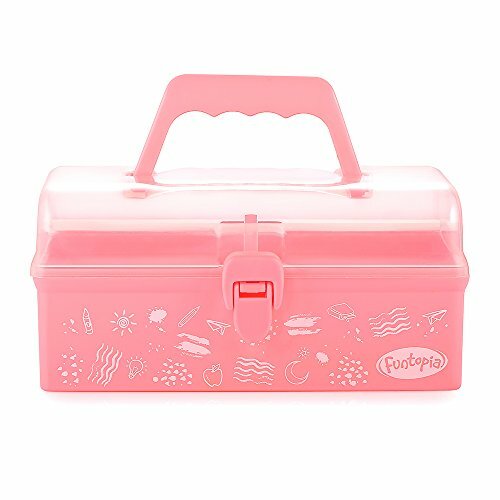 A cute storage box specially designed for kids or adults who love pink. Organizer for Kids' Items: Organize art and craft items, stationeries, toys, first aid kit, cosmetics, snacks, jewelry and other small items. Portable to Go: Whether take it to school, catch an airplane, go camping, or fit it into a school bag, your young kids can literally take it to almost all occasions. Secured Locking & Snug Grip: The premium clasp locks the storage box securely, while the ergonomic top handle is easy to hold and carry on the go for kids. Dimensions: 8.46 × 4.92 × 4.13 in / 215 × 125 × 110 mm; Weight: 6.35 oz / 180 g; Material: PP (Polypropylene). Worry-free 12-month warranty. For 12 months after the date of purchase, we take care of all quality-related issues with a REPLACEMENT OR REFUND. If you have any questions about this product by Funtopia, contact us by completing and submitting the form below. If you are looking for a specif part number, please include it with your message.